What does “honest” mean? Look up the word in a dictionary. Think of a time when honesty or dishonesty was very important either in your life or in a story you know. Why did being honest or dishonest matter? Tell this story (whether it’s your own story or one you’ve read or heard) to someone else. Either(1) imagine the story as a children’s book and draw some illustrations for it, or (2) tell the story to someone orally. As part of your telling, say why honesty is important. 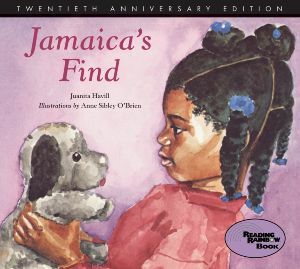 The children’s book Jamaica’s Find by Juanita Havill explores what happens when a young girl is dishonest by remaining silent. Find it at your public or congregational library. Front cover used by permission of Houghton Mifflin Harcourt. What does honest mean? Look up the word in a dictionary. Make up a story in which a girl your age must make a decision about honesty. Say why it matters, in the story, whether she is honest or dishonest. Tell the story you made up through writing, speaking, a skit, or a picture. What do we mean by “fair”? Think about a time when someone was unfair to you—perhaps by changing the rules in the middle of a game, dividing a dessert unequally, or blaming you for something that wasn’t your fault. Next, try to remember a time when you were unfair to someone else. What are some reasons that people treat other people unfairly? What are some ways that we try to make sure things are fair–for example, in sports, education, or contents? Describe an experience you have had with unfairness and tell whether you might handle the situation differently now. Express yourself by writing about your experience and/or sharing it out loud with others. You might even decide to tell about your experience through creating a poem or song. Prejudice is when you judge people before knowing them because of some characteristic they have or category of people they belong to, such as being black, lesbian, female, overweight, or poor. Discrimination is when people are treated unfairly because they belong to a certain category or have a certain characteristic. 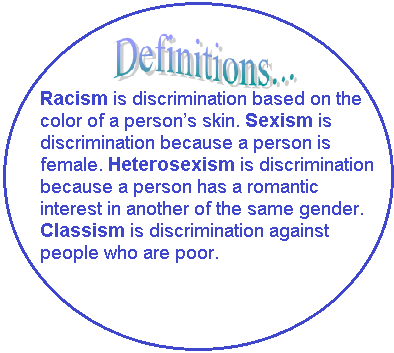 Racism, sexism, heterosexism, and classism are specific kinds of discrimination. Find out what your congregation does to fight prejudice and discrimination, including racism, sexism, heterosexism, and classism. Interview someone in your congregation, your family, or your community who is involved in fighting some form of discrimination or prejudice; ask about their experiences with discrimination and working to end it. Have you ever experienced or witnessed discrimination anywhere? How do your religious education, worship services, and/or other religious activities work to include everyone and be fair to them? Describe what you can do to help fight discrimination and prejudice. The “Golden Rule” is an idea of fairness found in many religions and cultures. Have you ever learned the Golden Rule? Read these various versions of the Golden Rule from different places and religions. Which version(s) do you like best? 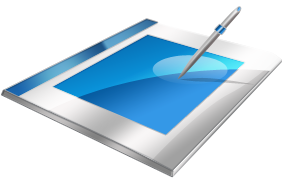 Make a story, picture, poem, or skit that shows what the “Golden Rule” means. Your expression can be something from real life or something you imagine. The honesty and fairness part of the Girl Scout Law does not just apply to relationships between people. It’s also important to be honest and fair with yourself. List two weaknesses you have (we all have them! ), and be careful not to exaggerate. Now make a list of 5 good things about yourself. Look at your lists: are you being fair to yourself in both? Is there any item where you’ve been too harsh or too easy on yourself? In what situations is it hard to be fair or honest with yourself? What could you do to be more honest or fair with yourself? Imagine that you are a blogger or a someone who writes an advice column for girls your age. Describe your advice for being honest and fair with oneself.